Welcome back to the final 2015-16 Stampin' Up! Artisan Design Team blog hop. It has been a great year and I have been honored to work with such an amazing group of talented demonstrators from all around the world. For my last ADT blog hop I had hoped to go out with a bang, but instead, it turned out to be more like a soft and gentle whisper. I made this lovely card with the Frosted Medallions stamp set. This set sneaks up on you and before you know it you are in love! Be sure to check back tomorrow. I will have another beautiful project using this amazing stamp set on our December Fancy Friday Blog Hop. This card started with a 3.75"x5.5" Crumb Cake cardstock panel. I stamped the large snowflake medallion with VersaMark ink and splattered the background with VersaMark refill using a stiff brush. Then I covered everything with white embossing powder and used a heat tool to set it. Next, I created a thread nest with some silver metallic thread and added a piece of Dazzling Diamonds Glimmer Paper punched with the Flower Medallion punch. I stamped and fussy cut a second medallion and layered that on top as well. Finally, I stamped and embossed the sentiment and added it to the top. I mounted the panel on a top-folding Basic Black card base and added a few sequins. This was my third time as an Artisan Award Winner/Artisan Design Team member and it has been such an blessing. However, I did not apply for the upcoming team. Being on the Artisan Design Team requires an extraordinary amount of time and dedication and I needed a break to focus on family. There are so many talented demonstrators and I thought that it was only fair to give other stars a chance to shine. I have several friends on the new 2017 Artisan Design Team and I am excited to see what they have to share over the next year. You will probably recognize some of the team members, but there are also a lot of fresh, new faces. Be sure to show your support by leaving lots of uplifting comments on their blog hops beginning in January. In the mean time, I don't plan on going anywhere, so don't forget to stop by and say "hi" every once in a while! Thank you so much for your love and support! Welcome back to another 2015-16 Stampin' Up! Artisan Design Team blog hop. If you are hopping with us, you should have just come from visiting my very good friend, Cindy Schuster. I love just about any style of Christmas decor, but when push comes to shove, I lean toward traditional elegance. Apparently my family does too because one Christmas I did a whimsical tree and my guys hated it. LOL! I have been lacking in stamping creativity the past few weeks, but just when I thought I didn't have one more ADT project in me, the Lord blessed me with an idea for this beautiful ornament. This past summer we were traveling to the beach when we stopped for dinner in Florence, Alabama. The restaurant was filled with stunning metal artwork. It was truly amazing and I took several pictures. I am pretty sure these are called Moravian Stars. I knew that I would probably never have the patience to replicate it with paper, but I think this ornament captures the essence. It is basically a modified Star of Bethlehem. This was the first ornament I made using the Pyramid Pals Box Thinlits. I stamped the snowflake from the Frosted Medallion stamp set on each point and then assembled it. For the poinsietta I used the Festive Flower Builder Punch along with the Vintage Leaves stamp set. Here is a step-by-step look at how I made it. I absolutely love how this turned out, but you know I cannot leave well enough alone. I wanted to see what it would look like if I took it to the next level and added even more embellishments...and this is how it turned out. I couldn't be more thrilled with each ornament and honestly, I love them both. I think it really depends on your personal decorating style, but in real life, the one with all the gold is stunning but very difficult to photograph. I hope you have been inspired by today's project and maybe even give it a try. If you are already going through the hop, you should have just arrived here from visiting our Artisan Team Leader and my good friend, Cindy Schuster. When you leave here you will travel on to visit the amazing Inge Groot. Our team this year is super talented and you are going to love all the fabulous projects so be sure to visit them all. Welcome back to another 2015-16 Stampin' Up! Artisan Design Team blog hop. This time we were given our choice of a few different products to feature. I am using the Tin of Tags stamp set for my projects today. If you are hopping with us, you should have just come from visiting my very good friend, Cindy Schuster. Every summer I make loads of blackberry jam and every Christmas I decorate them to give as gifts to friends, neighbors, and family. This year my sister visited and together me made over 100 half-pints. I knew right away that this fun sentiment from the Tin of Tags stamp set was perfect for this year's batch of jam. The chalkboard look is still very popular so for my first jar I decided to go with it. I also added a 1" strip of Warmth and Cheer DSP around the center of the jar and cut a circle to place on the top of the jar. I sponged some Jet Black StazOn ink onto the jar band for a really fun country farmhouse look. I thought it would be fun to stamp some wooden spoons and tie them on with some Kraft Rope Trim for a fun accent. For one final touch of color, I stamped and punched some holly leaves with the Holly Berry Happiness stamp set and coordinating Holly Berry Builder Punch. You may have also noticed that I used the new Stitched Layers Framelits to die cut the labels. I love how they add to the homespun feel to the jars. I have some family members who cannot tolerate seeds, so for them I made some jars of jelly. These quilted jelly jars are a little taller than the jam jars. I came up with this alternative tag so that it would be easy to spot the difference between the two. Just in case you are wondering how I covered the top of the jar...I wet a 6"x6" piece of dsp and then dabbed off the excess water. Then I carefully shaped it around the top of the jar and let it dry before adding the rope trim. I hope you have been inspired by today's projects. If you are already going through the hop, you should have just arrived here from visiting our Artisan Team Leader and my good friend, Cindy Schuster. When you leave here you will travel on to visit the amazing Inge Groot. Our team this year is super talented and you are going to love all the fabulous projects so be sure to visit them all. Welcome to a very extra special 2015-16 Stampin' Up! Artisan Design Team blog hop. By now you have probably heard about the new Stitched Layers Framelits dies. You can purchase Stitched Shapes Framelits ahead of their official release in the 2017-2018 annual catalog! With Stitched Shapes Framelits you can make thoughtful paper stitches in seconds, turning any project into one that is stitched from the heart. And during the month of November, coordinating stamp sets are 25% off! But don’t worry…Stitched Shapes Framelits will still be available for purchase after November 30. My first project focuses on the the Suite Seasons stamp set along with the new Stitched Layers framelit dies. You are going to love these new dies. 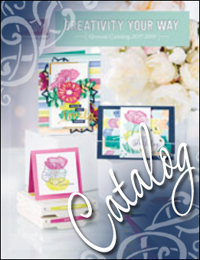 They add just the perfect amount of detail to all of your stamping projects. If I had my way, I would stitch on everything! Now I can have the look of stitching without the effort. I cut the flaps off one of the White Gift Boxes. Because of their size (3" square) I was able to die cut scalloped layers of Real Red cardstock with the Layering Squares Framelits and then use the new Stitched Layers framelits to cut some Candy Cane Lane DSP to layer on top of each piece. For the sentiment, I used one of the stitched circles and layered a scallop from the Layering Circle Framelits behind. I love how the die sets work together. Here is what I am talking about. You can see the Stitched Layers (Crumb Cake cardstock) paired with some of the coordinating dies from the Layers Squares/Circles/Ovals framelits (Garden Green). The shapes work wonderfully together and are the perfect addition to all of your paper crafting. I would even go so far to call them essential additions to your die cutting collection. I love this sentiment and I immediately knew that I wanted to use it along with some homemade cinnamon sugar to give as a Christmas gift. The jar holds about 1-1/4 Cups of sugar and I added 3-4 Tablespoons of organic cinnamon to the mix. Who wouldn't love to have this on hand for adding to their coffee, oatmeal, or making cinnamon toast on a frosty winter morning? For my second project I used the Oh, What Fun stamp set from the annual Idea Book and Catalog, to make this fun Santa hat treat box. I die cut two pieces of Real Red cardstock with the Pyramid Pals Thinlits to create the box. Nobody likes boring boxes, so I jazzed it up a little by using the Seasonal Decorative Masks to stencil on some VersaMark ink and then heat embossed both pieces with some Real Red Glitter Stampin' Emboss Powder. The Jolly Hat Builder Punch makes to most adorable addition to the tag and is the perfect way to reinforce the Santa hat theme. To add just a bit of interest, I added some clear dots to the tag with the Fine Tip Glue Pen. (Be sure to let it dry completely. I added them to my tag as the very last step.) This little box is just adorable and is perfect size to fill with candy and give as a stocking stuffer or as a gift for friends, neighbors, or just about anyone! If you are already going through the hop, you should have just arrived here from visiting my good friend, Cindy Schuster. When you leave here you will travel on to visit the amazing Inge Groot. Our team this year is super talented and you are going to love all the fabulous projects so be sure to visit them all. Welcome back to another 2015-16 Stampin' Up! Artisan Design Team blog hop. This time we were given our choice of a few different products to feature. I adore the Paisleys & Posies stamp set, so I decided to use it for my projects today. For my first project I made this adorable little 2" square box using Crumb Cake cardstock. It was easy to make and it is the perfect compliment to the card I made for today's hop. I stamped the cardstock with Basic Black Archival ink before I cut, scored and folded the box so that it gives to look of pre-printed cardstock. To create the half circle, I used a 1/2" circle punch. I will include the box pattern and materials used at the bottom of this post, so you can make one too. For the tag I carefully inked only the word "Thankful" and the line below and stamped it. This card is designed to coordinate with the box and is probably one of the easiest ways to use this stamp set because there is no coloring involved. This is just basic, good-old-fashioned stamping, but I added some stippling in the background using a Project Life Journaling Pen. To make those adorable embellishments I die cut Basic Black cardstock with the coordinating Paisley Framelits Dies, dabbed on some VersaMark ink and then heat embossed them using clear embossing powder. They are attached to the card front with mini glue dots. Be sure to scroll down to the bottom of this post for a list of supplies for both projects. If you are already going through the hop, you should have just arrived here from visiting our Artisan Team Leader and my good friend, Cindy Schuster. When you leave here you will travel on to visit the amazing Inge Groot. Our team this year is super talented and you are going to love all the fabulous projects so be sure to visit everyone on the team. Thought you might like to see my Instagram Tip that Stampin' Up! posted this past Tuesday. The theory behind Instagram is "a picture is worth a thousand words", but sometimes it does help to have more information. I mixed white craft refill ink with classic refill ink and applied it to my stamps with a sponge dauber. Here I used the Penned and Painted photopolymer stamp set for the flowers/leaves and after it was completely dry I stamped the sentiment from the Time of Year host set several times with Basic Black Archival Ink with a MISTI tool. Then I added clear embossing powder and heat set the sentiment. The inks I used were Real Red, Cherry Cobbler, Cucumber Crush, Garden Green, and Daffodil Delight. The card base is made from Crumb Cake cardstock. The colors won't necessarily stay true, but the effect is really amazing. You can let the ink dry naturally for a chalk-like appearance like I did here, or you can add clear embossing powder to intensify the ink colors. The ink will appear lighter after it drys. Welcome back to another 2015-16 Stampin' Up! Artisan Design Team blog hop. Every once in a while, Stampin' Up! throws an extra goodie in our Artisan box. This time they sent us the Jar of Haunts stamp set. But wait; I don't really do a lot of Halloween/Trick or Treat projects, so what is a girl to do? I decided to be "thankful" and I focus on Autumn/Thanksgiving instead. One of the things I love about this stamp set is that it is versatile. With a little help from the greeting in the Paisleys & Posies stamp set, I was able to create this card. I started by stamping with Archival Basic Black ink on Shimmery White cardstock and then watercolored the background with ink refills and an AquaPainter. The greeting is stamped with VersaMark ink and heat embossed with white embossing powder. I trimmed down the panel and mounted it with some Basic Black cardstock and then onto a Crumb Cake top-folding card base. I used a little trick that I learned from my friend, Amy O'Neil and removed the white backing from the White Perfect Accents and then attached them to the card with the Fine Tip Glue Pen. Did you know that Stampin' Up! posts Tips and Tricks by the Artisan Design Team on Instagram each Tuesday? Just go to Instagram and search for #ADTTipsAndTricks. If you are already going through the hop, you should have just arrived here from visiting my very good friend, Cindy Schuster. When you leave here you will travel on to visit the very talented Inge Groot. You will be amazed at all the fabulous projects created by the Artisan Design Team so be sure to visit everyone on the team.